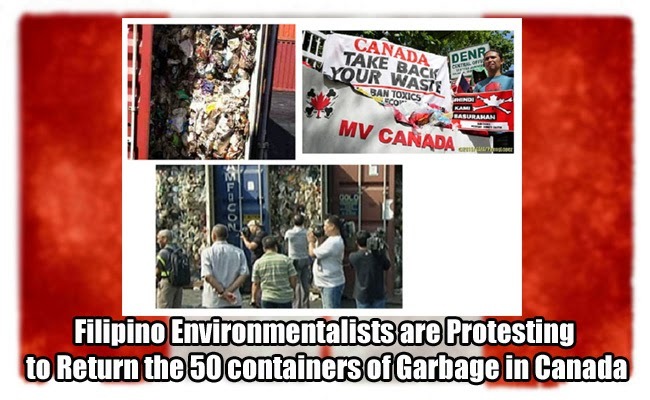 Filipino environmentalists walked in street of Manila demanding that the rotting garbage in around 50 containers must be returned to Canada. The said containers was suppose to contain recyclable plastics but turned out to be garbage. The containers were shipped to the country in 2014 by Chronic Inc., which is a plastics exporter in Ontario, Canada. It had been found out during the inspection of customs that the contents of the containers are actually household waste including diaper. In had been two years since the container arrived in the country and the environmentalists are fighting for it to be shipped back ever since, but Canadian government stood firm sighting that it won’t be shipped back to them, standing their ground that it was a commercial matter and must be settled by parties privately. On the other hand, the Philippine government also did not side with the environmentalist saying that the said waste was not toxic and can be dumped to the country’s landfill. Environmental Management Bureau (EMB)’s assistant director lawyer, Jonas Leones, shares that even if they keep on pushing that Canada should take back the containers, they won’t do it. The only answer will be to file a case in the international court which will take years and the root of the problem will still be there during the litigations. However, the environmentalists refused the offer of the Philippine government. Angelica Carballo, an environmentalist, shared that we must not be a dumping place of any other country and Canada should know that. The government should stand up and demand that Canada should take back the waste. The government is expecting to have the clearance to dump the garbage in the local landfill, but gave assurance to find and punish those responsible for the shipped containers.